Walking onto a sales lot can be a nerve wracking experience. Dealing with a pushy salesman, finding the right trailer, and then feeling confident in your purchase will likely leave you emotionally exhausted and wondering if you got the best deal possible. In contrast, buying online from Double D Trailers can be less stressful, more beneficial, and actually SAVE you money. Read on to learn more! Poor customer service and distrust is a major problem when you are relying on that dealer to help you choose the best trailer for you and your horses. You may end up with an overpriced or poorly built trailer that leaves you disappointed. A dealer focused on making the sale wants to convince you to buy the biggest and best trailer on his lot, so he can reap the financial rewards. He has a lot filled with various brands, floor plans, and models so he has the choice of which brand to promote to you so he can either make the most money or move his old inventory to make way for newer models. Brad has seen this time and time again. “Dealers add and drop brands frequently so it's amazing how one day brand ‘A’ is the best, yet six months later brand ‘B’ is the best.” When you purchase a trailer from a lot like this, you are paying not only for the trailer, but also for the substantial mark up in price so he can maintain his inventory and staff the operation. Finally there are other questions to consider: What if the dealer goes out of business and you have an issue with your trailer? What if you move out of the area? What if the dealer drops a brand and goes to something completely different? Each of these situations could leave you without a place to turn for help with your trailer issues. Many of these issues can be solved by instead buying from a company that has stood behind their brand and designs for over 20 years. Let’s take a look at just a few of the benefits of buying online from Double D Trailers. The #1 reason to buy online from Double D Trailers is because of our superior safety features. 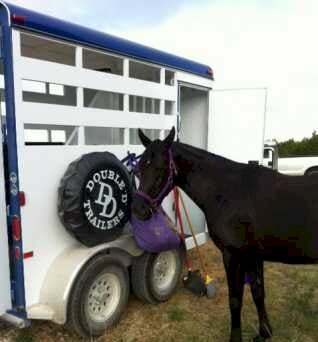 Front to back, our trailers are going to do a better job of protecting you and your horse while you are traveling. Unique features and materials like the Z-frame design, tubular dividers, bumper-to-bumper full insulation, SafeBump roofing system, Rumber flooring, SafeKick walls, and SafeTack feature work to protect you and your horse on the road. Several of these technologies are patented so we are quite confident you won’t see them with other manufacturers. The trailers at the dealer’s lot have been marked up, sometimes significantly, to cover the cost of sitting on the lot week after week and to ensure that the dealer makes a profit. In contrast, all of the Double D trailers are custom designed and built. Once the design has been finalized, constructed, and approved, it is delivered directly to your farm where you can give it a final inspection before you accept your order. The convenience of at-home online shopping can hardly be overstated. You can sit around in your pajamas, drink a hot beverage, and browse through design options at your leisure. This is a far cry from walking around a hot dealer’s lot and feeling pressured to make a decision then and there. This company is run by good people with strong values. We take the time to listen to the needs of each client and help them come up with a design that works best for their particular situation. Sometimes this process can be done in a matter of hours or days. Sometimes, it takes months to create the perfect custom design. This is just one of many happy customers, so we’d encourage you to check out more customer testimonials here. Since Double D Trailers sells nationwide, we are familiar with helping clients service their trailers wherever they may be. In comparison to trailer dealers who may not know much about service and repair work, Double D can help with service in your area. After leaving a sales lot, it can be hard to shake the feeling that you may not have gotten the best deal. Things are different with Double D.
We deliver new trailers nationwide for a flat delivery fee. Plus, any small damage issues are covered under the bumper-to-bumper warranty. This is all in writing, so you are guaranteed to be happy with your purchase. 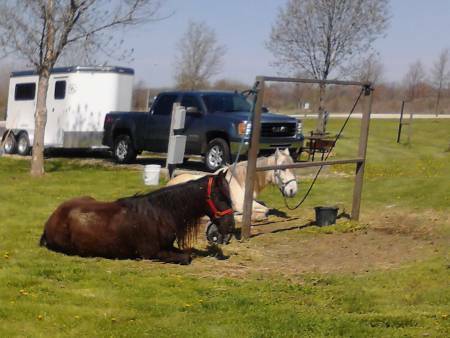 The process to create your new custom horse trailer is pretty easy too. Convinced yet? If not, we highly recommend you head over to the testimonials page and read some more awesome feedback from happy Double D Trailers owners. Then you can commit to never visiting a local sales lot again! QUESTIONS: Are you already a Double D Trailers owner? If so, what was your purchasing experience like? What are your questions about the design and purchasing process?